സച്ചിനോട് ആരാധനയെങ്കിൽ സേവാഗിനോട് ഇഷ്ടമായിരുന്നു ക്രിക്കറ്റിനെ സ്നേഹിക്കുന്നവർക്ക്. എല്ലാം തികഞ്ഞ താരമായിട്ടല്ല. കളിച്ചു കൊതി തീരും മുൻപേയാണ് ഈ മതിയാക്കൽ. അല്ലെങ്കിലും ഒരു ട്വീറ്റിലൂടെ വിരമിക്കേണ്ട ആളായിരുന്നോ സേവാഗ്. ക്രിക്കറ്റിന് പുതിയവേഗം തീരുമാനിച്ചവന്റെ ഗതികേടാണിതെന്ന് ആരാധകന് നിരാശപ്പെടാതെ വയ്യ. നീലക്കുപ്പായമിട്ടാൽ സ്നേഹം രാജ്യത്തോട്. ബാറ്റെടുത്താൽ അരിശം പന്തിനോട്. ക്രീസിലെത്തിയാൽ ചിന്ത വിജയം മാത്രം. എന്തായിരുന്നു സേവാഗ്. ആദ്യ പന്തിനെപ്പോലും അതിർത്തി കാണിക്കുന്ന ധീരത. ടെസ്റ്റിലും ഏകദിനത്തിലും ഏകശൈലി ശീലമാക്കിയ ആവേശം. സച്ചിനെപ്പോലും അമ്പരപ്പിച്ച ചാരുത. കണ്ണിമ വെട്ടുംമുൻപേ കളി കൈയിലാക്കുന്ന ചടുലത. ഓഫ്സ്പിന്നറായി വന്ന് ഓപ്പണറായി മാറിയ ആകസ്മികത. ടെസ്റ്റിലും ഒറ്റദിനം കൊണ്ട് ഇരുന്നൂറടിക്കാൻ കെൽപ്പുള്ള കരുത്ത്. അതിനൊക്കെയപ്പുറം നേർത്തഭാവത്തിൽ എല്ലാമൊതുക്കുന്ന ആത്മാർത്ഥത. ഒരു കാലമാണ് പാഡഴിക്കുന്നത്. ഒരു ചരിത്രമാണ് ബാറ്റ് താഴെവെയ്ക്കുന്നത്. ടീമിലെ പക്ഷങ്ങളോട് മുഖം തിരിച്ചപ്പോൾ സേവാഗ് ഓർത്തുകാണില്ല. അവിടെ മികവിനെ വീട്ടിലിരുത്തുന്ന പ്രതികാരം ഉരുണ്ടുകൂടുന്നുണ്ടെന്ന്. Last edited by BangaloreaN; 06-08-2016 at 01:11 PM. Dear adikoodal Fans . . .@boxoffice . . .WOM > Starpower . . . Just remember dattt . . . .
Sir Don Bradman is considered the greatest batsmen of all time as he averaged approximately 100 in test cricket. 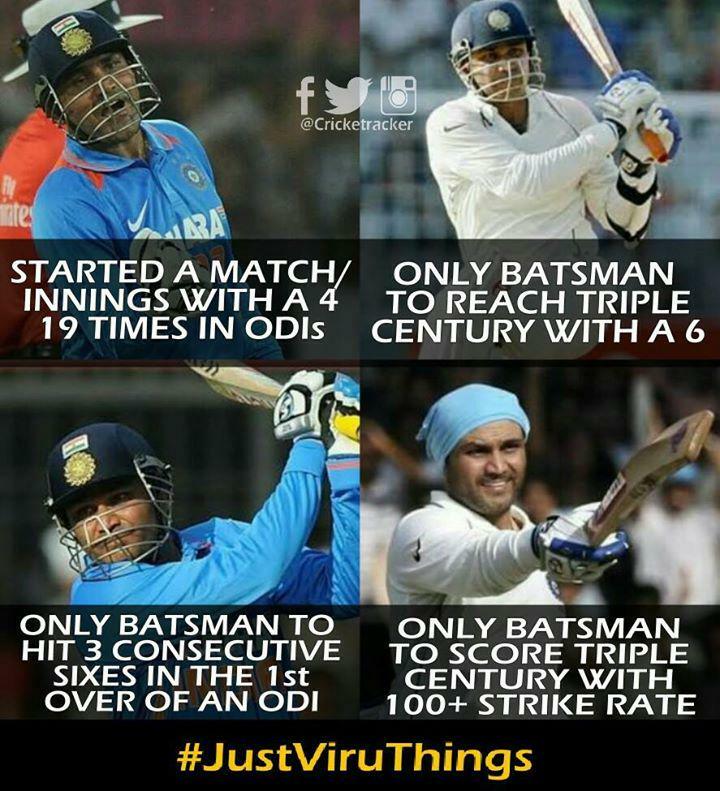 None of the modern batting â€˜Gurusâ€™ are able to even come close. This batting Guru has scored a hundred 100sâ€™ in his career, a record which seems to be unbreakable. He has the highest number of runs in both ODI and Test formats, with over 34, 000 runs under his belt. Brian Lara is one of the paramount ODI and test batsmen of all times. Lara scored the highest 400 runs in an inning of test cricket and has dominated the best bowlers in the world. Richard is well renowned for his destructive and explosive batting skills. He averages 47+ in ODI with a SR of more than 90. 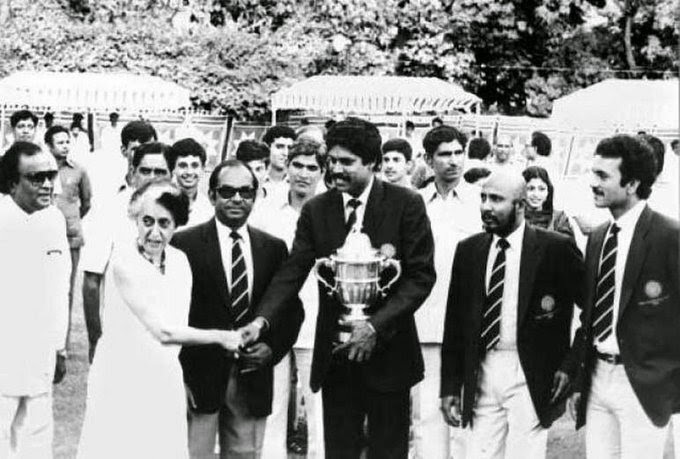 Under the Captaincy of Kepil-Dev India won their first World Cup title in the year 1983. He was a gifted batsman along with phenomenal bowling skills. In short, Kapil was a genuine all-rounder. Gary Sober is one of the best all-rounders the world has ever witnessed. His temperament, class and test match batting average is above many legendary cricketers. Imran Khan led Pakistan towards 1992 world cup glory with his outstanding leadership and cricketing skills. He is considered one of the top notch bowling all-rounders. Ian was the best all-rounder of the 1970â€™s, and probably one of the best all-rounders England ever has produced. Dennis Lillee is renowned as one of the most lethal bowlers of all time. If we talk about the best all rounders, no one can beat the elegance and class of Jacque Kallis. He has scored over 24,000 runs with 500+ wickets in his career. His class is matchless. Muthiah the â€œking of swingâ€� is undoubtedly one of the greatest off-spinners of all time. He took exactly 800 wickets in his test career, a record which seems to be unbreakable after the introduction of T20 edition. Shane Warne is the greatest leg spinner of all time, and dodged the batsmen for 708 times in Test Cricket. His cricketing career is considered to be the benchmark for all the leg spinners. People remember Wasim Akram as the â€œKing of Swingâ€�. A very destructive Pakistani bowler, whoâ€™s bowling created serious problems for batsmen, he also scored 257 runs in an inning of Test match. Rahul Dravid has the best defensive technique in the world of cricket. He is also known as â€˜The Wallâ€™. Dravid has scored 13,000+ runs in test cricket with an astonishing average of 52.31. He has passed a score of 50 runs 194 times in his career. Australia has won two consecutive world cups under his captaincy. He is one of the most stylish and classy batsmen and has dominated over all the best bowlers. Punter has scored 27,000+ runs and 71 centuries in his prolific career. Inzamam is considered to be one of the greatest players of all time. He played an important role for Pakistan in their 1992 world cup victory. Inzamam has scored 129 half centuries and 35 centuries in his career. Sanath is one of the greatest attacking openers of world cricket. He is considered one of the finest all-rounders of all time, due to his aggressive batting and spin bowling. He has played over 400 matches in ODI. McGrath is considered the top bowler of Australian and world cricket. He bowls with a mediums fast pace and holds the record of most wickets in World Cup. If anyone thinks of the best batting wicket-keeper, certainly the name of Adam Gilchrist comes to mind. He was an aggressive left hand batsman, who destroyed the front line bowling attack of all the best teams. When it comes to power, no player on this planet can hit the ball as hard as Gayle. He is a sensation whose batting is filled with extraordinary aggression. Jack Hobbs has been named â€˜The Masterâ€™ due to his brilliance when it comes to batting. He averages 56.95 in test cricket which is a remarkable achievement. Wally is regarded as one of the premier batsmen of England as he scored over 50,000 runs in his first-class career and 7,000+ runs in test cricket with an amazing average of 58.45. South Africa has produced two of the greatest all-rounders of all time. One is Pollock and the other is Jacque Kallis. Pollock was more of a bowling all-rounder, whose magical deliveries troubled all the great players. He took 421 wickets in test matches with an amazing average of 23.11. Miadad is one of the toughest cricketers of all time and his attitude has made him a standout in the sport. Last edited by kannan; 09-16-2015 at 03:35 PM. Last edited by kannan; 10-20-2015 at 07:40 PM. Former India opener Virender Sehwag has announced his retirement from international cricket and the Indian Premier League on his 37th birthday. 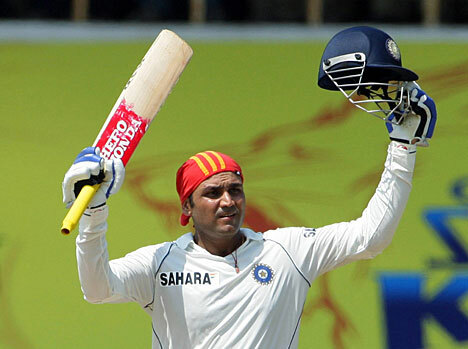 Sehwag, who won the World Cup with India in 2011, played 104 Tests, 251 one-day and 19 Twenty20 internationals. He scored 8,586 Test runs at an average of 49.34 and is the only Indian to score an international triple century. He also scored 8,273 ODI runs at 35.05. "Cricket has been my life," Sehwag said in a statement. "I did it my way." He will to continue to play first-class cricket, saying he "still has the hunger inside", and will try to help young players coming through. Sehwag, who had a spell with Leicestershire in 2003, has not played for India since 2013. MS Dhoni, who captained India to victory in 2011, led the tributes to his former team-mate as he compared Sehwag to West Indies batting legend Sir Viv Richards. "Didn't see Viv Richards bat in person but I can proudly say I have witnessed Virender Sehwag tearing apart the best bowling attacks,"Dhoni wrote on Twitter. Sachin Tendulkar, who retired in 2013, added Sehwag had been a joy to watch and play with.Tendulkar said he "had the best seat during most of his superlative performances on the field" and "loved his instinctive approach to batting and life". Last edited by kannan; 10-21-2015 at 12:05 PM. Ninakkishttamulla kaazhcakal njan kaatti tharaam"